With only a couple of cordless self-propelled mower to choose from right now, Ryobi offers very good performance with a compelling price point. Battery-powered lawn mowers have been around for several years now (it feels really weird to say that!) and technology continues to trickle down from gas models. So the next step had to be cordless self-propelled mowers. They just haven’t come along quite as quickly. With only a couple to choose from, I’m taking a closer look at the Ryobi 40V Self-Propelled Lawn Mower. Ryobi’s 40V Brushless Lawn Mower has a very functional design and you’ll notice most of the same features are present on the self-propelled model. That’s a positive since there isn’t much to complain about with that design. If you’re going to cut anything more than a small city lot, you need a brushless motor to extend the runtime in a cordless lawn mower. If one battery needs to power the drive and the motor, it’s non-negotiable. Ryobi makes sure you get the advantages of a brushless motor. The name tells you that the Ryobi 40V Self-Propelled Lawn Mower has a self-propelled drive, but how well does it work? 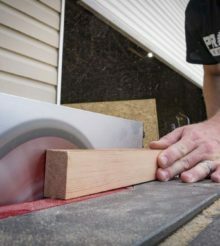 The controls are easy enough – there’s a slider that you use to determine how fast you want to cut. I almost never put it more than a third of the way forward and there’s plenty of top end speed if your grass is at a level to cut at that pace. What I don’t like is that the control slides too easily. When I’m turning the mower around tall obstacles like trees, I have a tendency to bump it forward. Rather than the infinite control slide, I’d rather have it click into position so that it’s not as easy to bump out of place. With telescoping handles that fold forward, storage space is minimal since you can stand the Ryobi 40V Self-Propelled Lawn Mower up in the corner of your shed or garage. In order to fold the mower up, you’ll need to drop the mower height all the way down to get the lever out of the way. You’ll also want to remove the batteries before folding it up. You can get them out in the folded position if you really work at it, but it’s not worth the hassle. One thing to keep in mind is that there are sensors in multiple places around the mower. So if you’re all set up and it doesn’t start, first check the locking clips at the pivot and telescoping points to make sure they’re fully engaged. If anything isn’t locked, the mower won’t run. The Ryobi 40V Brushless Lawn Mower has a known issue with a microprocessor switch on the frame. I have not come across that issue on this model. You have seven cutting height positions ranging from 1-1/2″ to 3-3/4″ on a single-point adjustment lever. It’s pretty easy to use and ensures that all four wheels keep the deck at the same height. This helps maintain an even cut. Depending on the size of your lawn and whether the grass is damp when you cut it, you may want a spare battery. There’s storage right next to the main battery connection, so if you do need to switch, it’s a 5-second process. After a more than 8 weeks of use, I’ve only come across a couple of things I’d like to see an improvement on. The first is the aforementioned drive speed slider. The other is that there’s no side discharge option. You can mulch or bag, but no side discharge. That will come into play if the grass gets too tall to mulch and you don’t want to bag. I typically mow at 3 inches and my lawn is pretty thick right now. On the cut quality side of things, the Ryobi 40V Self-Propelled Lawn Mower leaves a nice, even cut. That’s important for a clean look but isn’t the case with some other mowers I’ve used. No matter what mower you use, keeping the blade sharp is key to maintaining a clean cut. I prefer to mulch rather than bag simply because of the volume of grass I cut every week. But if I let the lawn go more than 7 days, I’ll hit several areas where it’s a struggle to cut as full swath and effectively mulch the grass. And if the grass is wet, it’ll make a nice layer of stuck grass on the underside of the deck. This is where I’d love to have a side discharge option rather than just the mulching or bagging. It’s also in the slightly higher or slightly wet grass that the difference between battery power and gas power start to show up. Gas mowers at the same price point will cut much more confidently. It’s not that there isn’t enough power, though. You just need to cut once a week during the growing season – the same rate you cut to keep your lawn looking nice anyway. One of the reasons cordless self-propelled lawn mowers are a challenge is that you have to divert battery energy from the blade to the wheels. The ability to do that isn’t the problem, the battery capacity is. Using a 5.0 AH battery with Ryobi’s Brushless Lawn Mower, I can get around 45 minutes of runtime. The self-propelled model only drops 5 minutes in ideal conditions (dry grass on a week’s growth). For a 1/4-acre lot, you can complete the lawn on one charge if you keep moving. Wet grass, however, is not your friend. Since most of us like to mow in the morning when there’s still some moisture in the grass, you’ll want to have a second battery. I use the 3.0 AH pack from the Ryobi’s 40V Jet Fan Blower as a backup for the last 5 – 10 minutes of cutting that I usually fall short. But if you let the grass go more than a week (it can grow a 5 – 6 inches per week in the Florida summer), you’ll need two batteries plus time to recharge one of them. The bottom line is that the battery capacity limitations mean you need to stick to standard weekly maintenance cuts in dry grass if you expect to finish on the included battery. The Ryobi 40V Self-Propelled Lawn Mower starts with an excellent physical design that adjusts and stores easily. There’s enough power in the motor to handle weekly maintenance cuts, but lawns that go much more than a week will give it a run for its money both in the ability to cut full swaths and complete the cut on one charge. There’s plenty of drive speed to the point that I never even bump it up to the halfway point. The only downsides are relatively minor for most users. You can bag or mulch, but there’s no side discharge. It’s also possible to bump the speed control without much effort and kick yourself into a higher speed. Aside from that, the limitations are really based on how tall you let the grass grow and how wet it is when you cut it. This model is going to be good for 1/4-acre lots and under. You can realistically do 1/3-acre, but you’ll need an extra battery at that point. Pricing is better than EGO’s model at $399, but you give up some battery capacity and an arguably deeper line of tools. I have the battery operated lawn mower. The 1st one went back with 3 weeks. The battery did not hold a charge. I exchanged it for another one. My mistake. Second season in Florida, and it stalls every 10 feet. To the repair show we go. But the down side, Like there is an upside, is that my battery is now compromised. Starting every 10 feet just is wearing down the battery. If at 1st it doesn’t work, don’t exchange for the same one! You make it sound like self-propelled cordless is a new thing. I got a self-propelled cordless Ryobi back in… 1992? 1993? Ran that thing almost 20 years, with multiple replacements of the (lead-acid) battery. GREAT mower. Ryobi didn’t have a good option when the old one finally died, so I bought a used gas one. Used it for about a year or two and then I got myself an E-Go 21″ self-propelled. Another great mower, though not quite as good at mulching.